Last month, a teacher in Alaska, 32-year-old Candice Berner, was killed by wolves. The report states that the fatality could be the 1st on U.S. soil in more than 50 years, noting that attacks by wild wolves - as opposed to wolves kept as pets - are extremely rare worldwide and number no more than a handful per decade. Most of the fatal maulings occur in Canada and Russia, reads the article, and none has occurred in Alaska until now. (Wild wolves do sometimes attack humans, including instances in Alaska in 1988 and 2000.) Within a week, state biologists located the 2 wolves they believed were responsible for the latest attack and shot and killed them from the air. It is true that pet wolves sometimes turn on their owners. A hybrid killed a 5-year-old boy in Kentucky in 2002. A breeder of wolf-dog hybrids was killed by her pack in Salem, Pennsylvania, in 2006. But there are many people who defend keeping wolves as pets. "Critics argue that hybrids are unpredictable and dangerous, that they make poor pets and that there is no rabies vaccine available for wolves or their hybrids. Proponents claim the hybrid wolf is a good companion and is useful in educating the public about wolves." Dogs and wolves will breed, even without human intervention, because the animals are so closely related genetically. It has long been known (although this, too, is disputed) that dogs descended from wolves, but researchers have just determined through genetics that the origin of dogs was likely in the Middle East. Like other animals, wolves are studied intently by scientists using innovative equipment. When it was determined that their numbers were dwindling, gray wolves were added to the Endangered Species List. Since then, they have been dropped and added to the list more than once, with several groups lobbying for their own interests: farmers who want to protect their livestock (and are not satisfied with scaring them off with rubber bullets), hunters want to be able to shoot wolves for sport, and contractors who want to be able to build in the northern Rockies. Meanwhile, the most prolific pack of wolves in Yellowstone National Park has been killed - by other wolves. Packs of endangered wolves have migrated from Canada and betrayed their presence as far south as Massachusetts where one was killed after taking down a dozen sheep. (Strangely, one farmer controls his flock of sheep using a poster of a wolf to take advantage of their natural fear, and ironically, an ecology journal has determined that wolves prefer fishing to hunting - although paleontological research shows that they devoured mammoths.) But now the wolves in Canada pose another threat by breeding with coyotes: "[Coywolves] have the wolf characteristics of pack hunting and aggression and the coyote characteristics of lack of fear of human-developed areas," says geneticist Bradley White, who has studied the hybrids for 12 years. Wolf pups living in the wild are subject to being snatched up by predators, including large birds. Those being raised in wildlife preserves are better protected, but in less than natural situations. 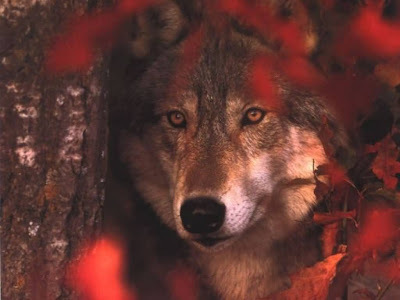 But it is the protection of human children by wolves that has become the stuff of legend. Tales of feral children surviving with wolves have been documented - but now so has the prototypical legend! Because of the kindness and the viciousness wolves have shown to humans, there is now ambivalence even about telling the classic fairy tale of "Little Red Riding Hood" to children. In the latest version, instead of eating the girl and her grandmother, the wolf makes friends with Little Red Riding Hood and becomes a vegetarian!